An effective mission statement is always considered to be an important element of a business. According to a Wikipedia article, “A mission statement is a short statement of an organization’s purpose, identifying the scope of its operations: what kind of product or service it provides, its primary customers or market, and its geographical region of operation”. Hence, a mission statement plays a crucial role in defining the nature of an organization and its reasons for existence and being. So if you are running a startup business, a good mission statement can bring a lot of benefits to your company. One of the main reasons for writing a mission statement is to make your target customers get to know more about your business and what you can offer to them. Most importantly, a well-crafted mission statement samples is a powerful tool brand strategy that helps you build a strong business reputation, as well as help the member of your organization to be more focused on delivering good services to your customers. 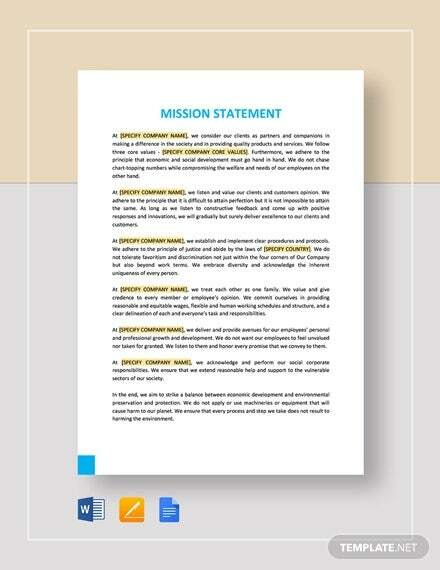 So how do you write a mission statement that is perfect for your business? In this article, we have provided you with a few expert tips on writing an effective mission statement. Read on to know how. When identifying the values of your company, make sure to discuss it with the member of your organization. Choose the ones that you strong think are useful when providing goods and/or services to your customers. There is no need to use fancy wording when describing the things your company does. If your company’s main product is shoes, then clearly state that the purpose of your company is to manufacture or sell shoes to customers. Keep in mind that your mission statement is not just a slogan for your business. Instead, use it to provide vital information for people who are not well familiar with your business. Aside from an effective mission statement, your company also needs a good marketing strategy. We have a collection of marketing strategy templates that you can download for free. So what are you waiting for? Download them now and use it as your reference!